Brinovo Marine offer new arrival of Leisure Boat with triple pontoon tubes! It will bring you nice life and enjoy the peaceful time. Family party, friends party, fishing partyall available to open on the deck. Enough space on this 25ft boat, it can entertain 12-15 passengers with 60-120hp for normal cruise, if you are fan of high speed, it can be installed by 150-200hp for fast patrol. 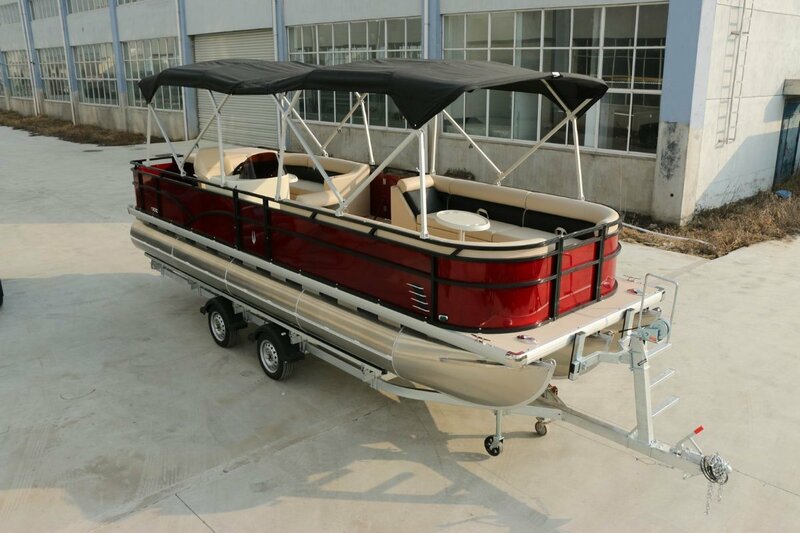 What you saw is our new model, it has more fittings to enhance its leisure function, such as changing-room, portable toilet, built-in fuel tank with gaugewelcome to talk your details of requirement, we can customize your boat. With our stable performance, please bring your families, friends and pets on board of it, wherever and whenever; enjoy the living in the open! We also offer suitable 8.3m trailer which can be used on road, included in the prices. For outboard engine, due to our boat is brand new boat imported from overseas, we suggest you to buy engine from local dealer to get the after-sales service. Contact us to obtain this excellent boat to realize your outdoor dream!